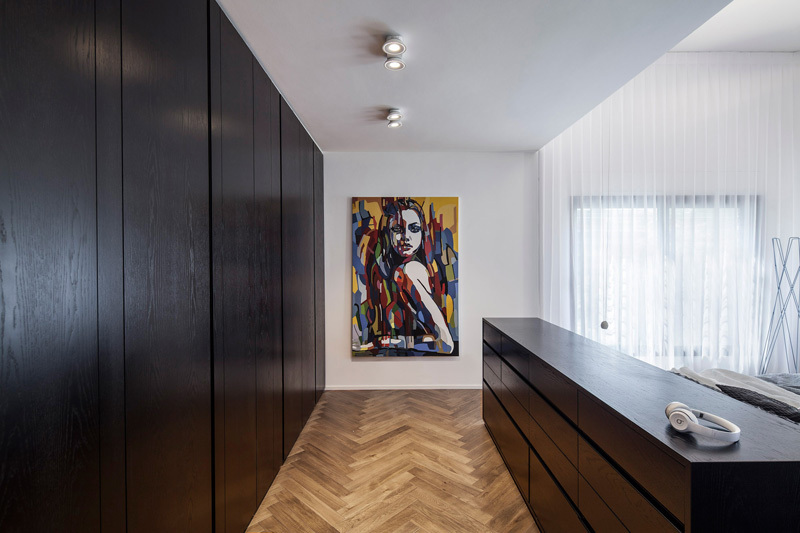 Tal Goldsmith Fish Design Studio have designed a house for a couple that decided to work from home, so they could spend more time with their young children. 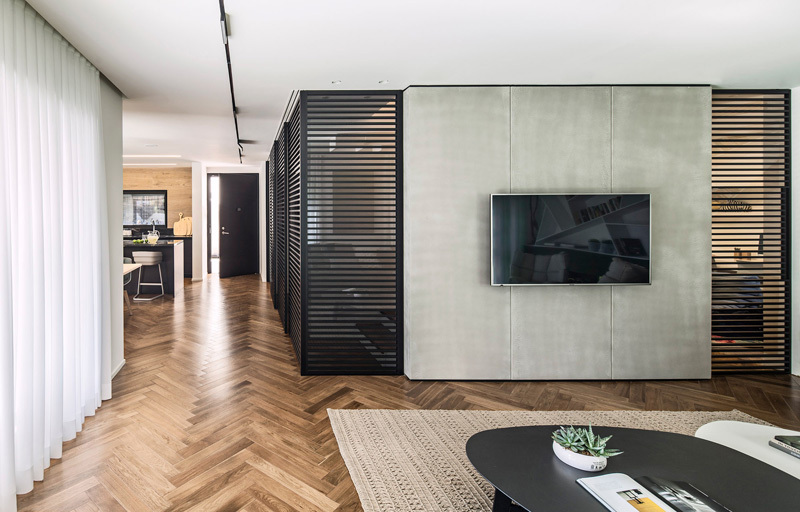 The home has an open plan dining/living area, that allows the parents to keep an eye on the children from their offices behind the glass and aluminium partitions seen on the left. 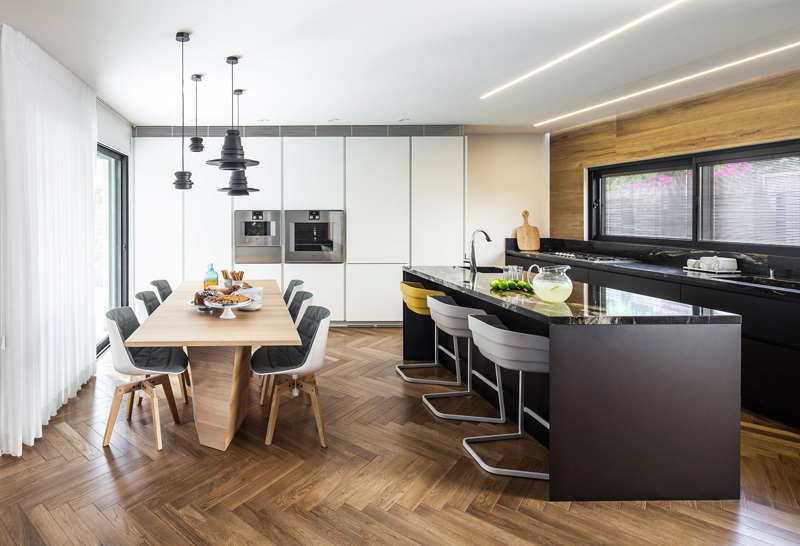 The home has a combined dining room and kitchen, with the dining room kept bright, and the kitchen featuring darker materials to define the spaces. 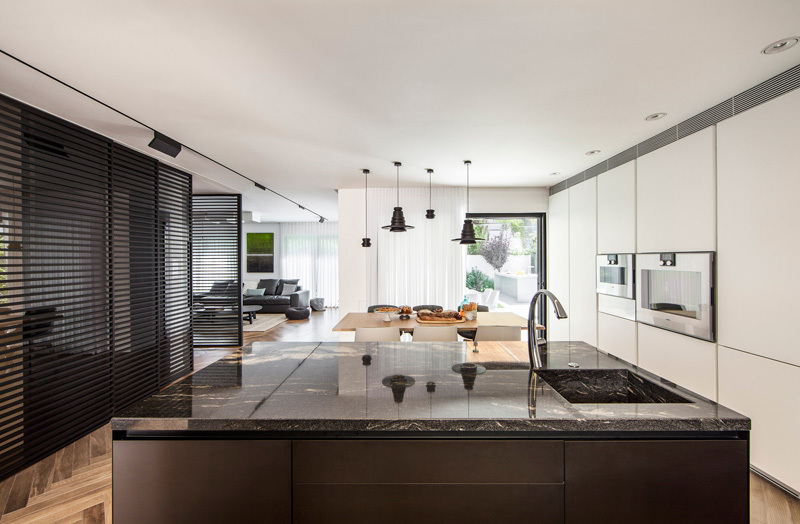 Sculptural black pendant lights create some drama above the dining area. 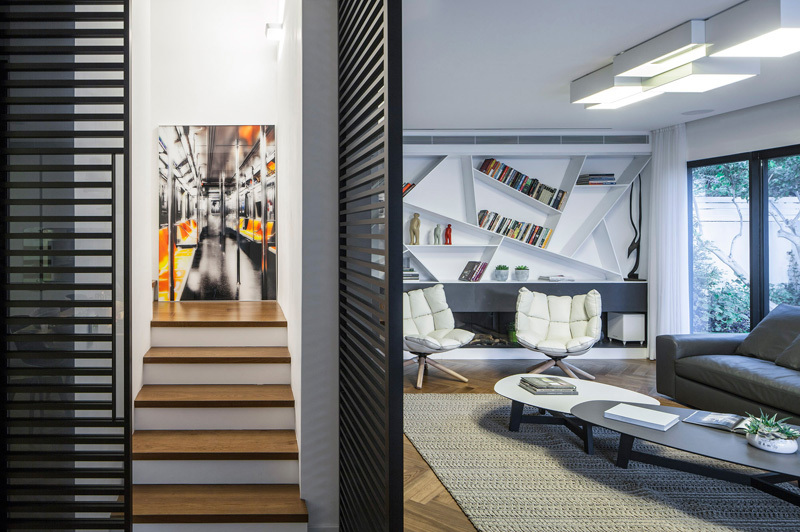 Glimpses of the home office are possible, but remain mostly hidden behind the partitions. 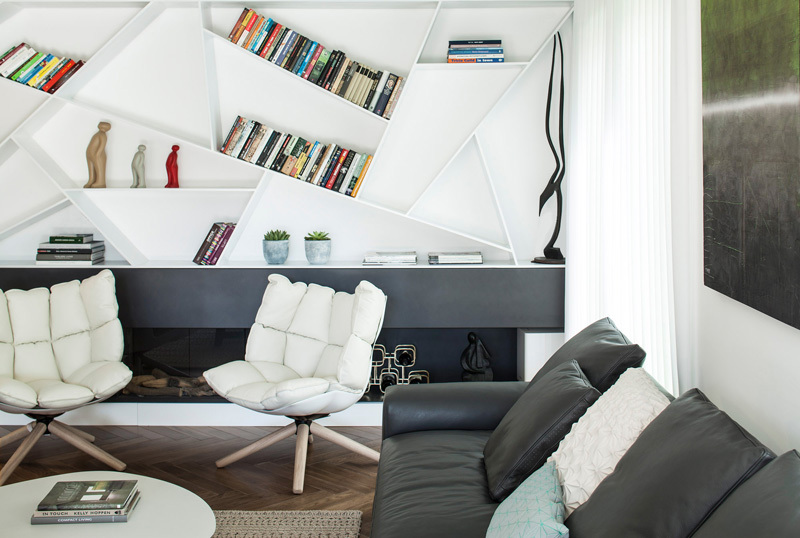 The living room features a custom white geometric bookshelf, made from aluminum, it weighs approximately half a ton, and is a single unit so that it doesn’t have any complicated connections. The bookshelf, fireplace, and backyard are all visible from the home office. 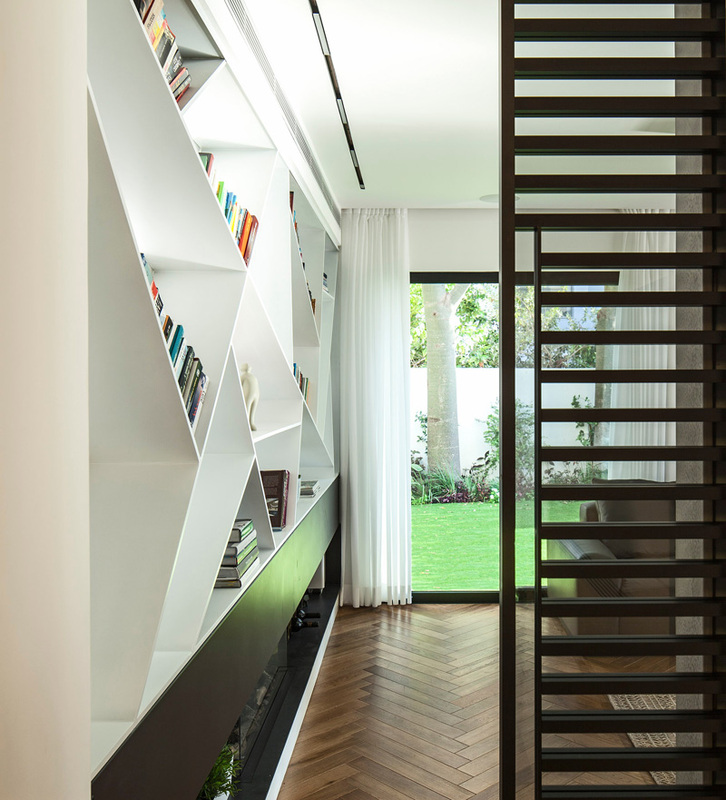 Located between the office and the living room are the stairs leading to the second floor. On the second floor, the parents have a master suite that features a lofted ceiling and lots of light. 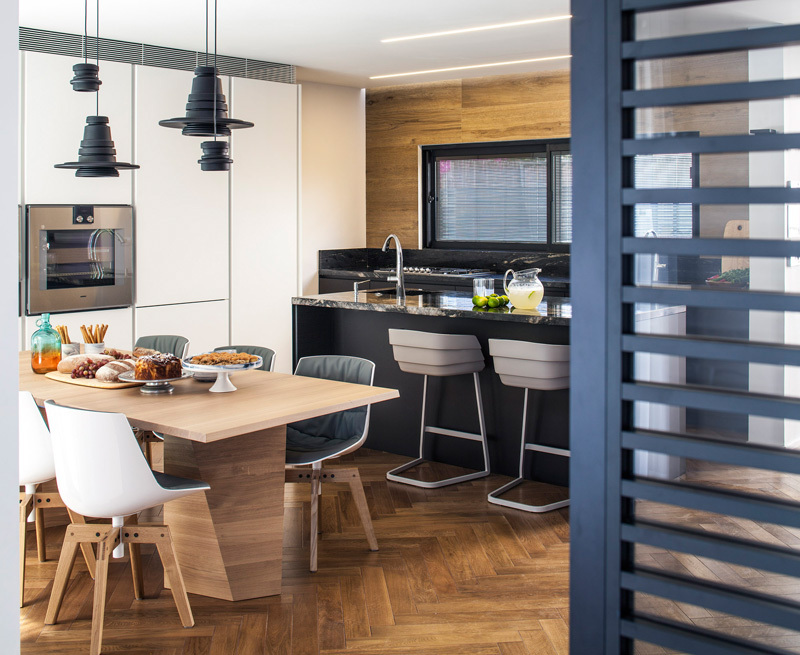 A wall of cabinets give the parents plenty of storage. A chest of drawers separates the space, and doubles as a headboard for the bed. 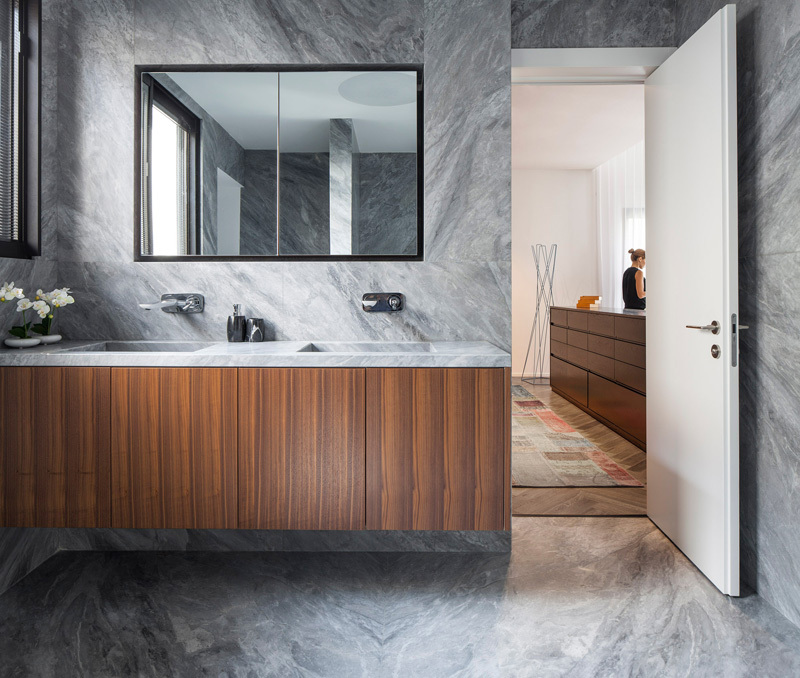 The master bathroom features one type of stone that has been used for the floor, walls, sinks and countertop. 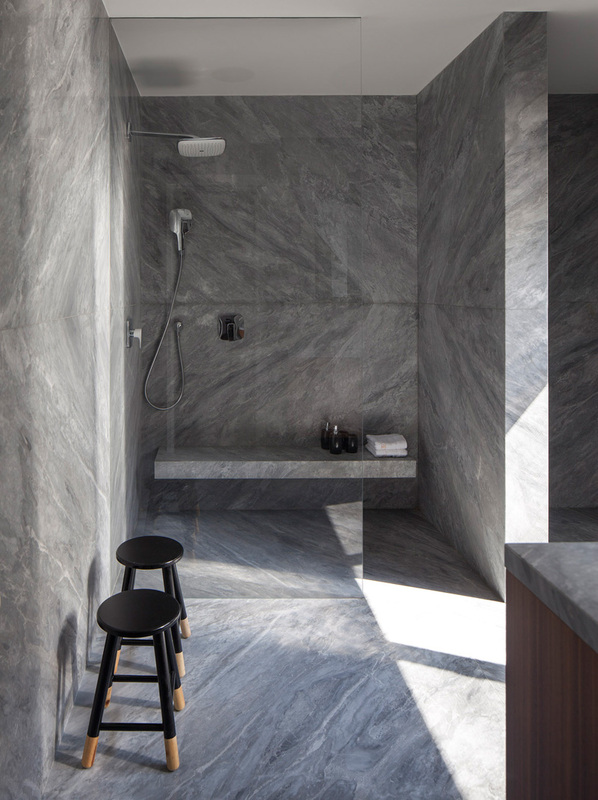 The stone has also been used for the shower that features a built-in seat. 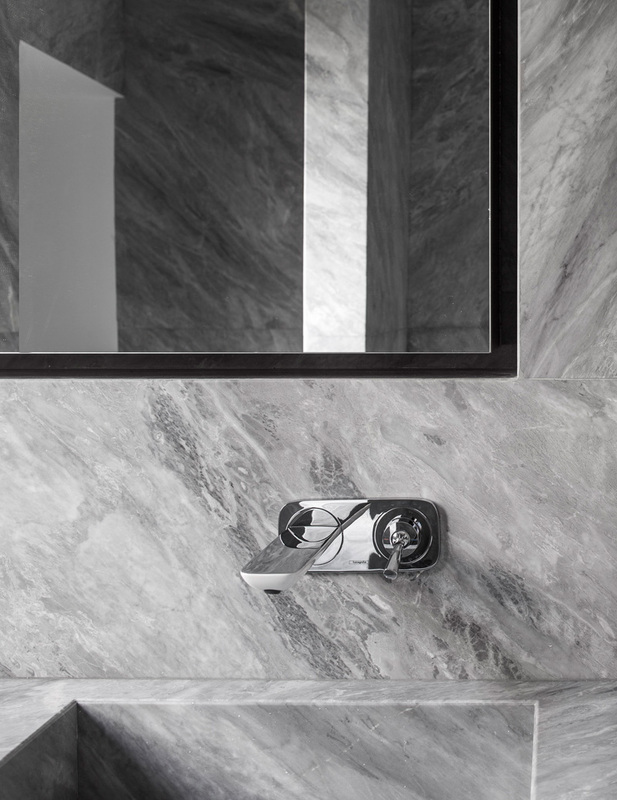 The reason so much of the same stone was used, is it is believed it will create a calm, monotonous, and pleasant environment. 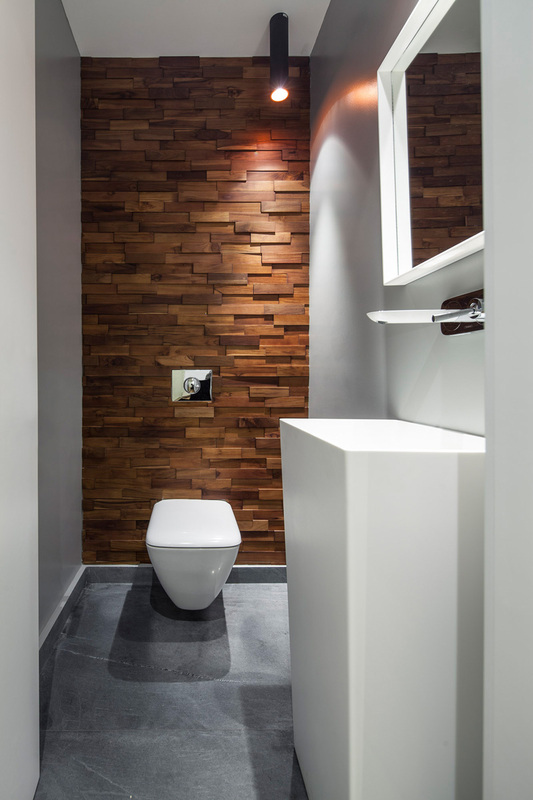 In a second bathroom, a wood feature wall becomes a focal point. 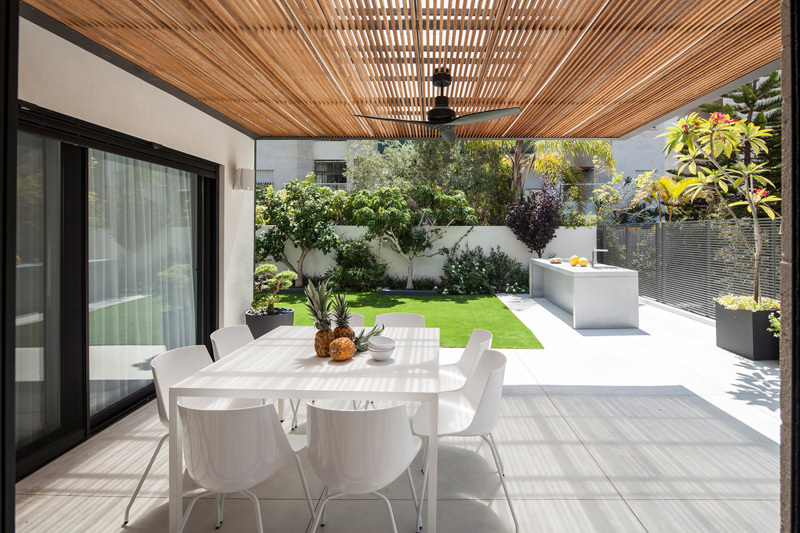 Outside, the backyard features a covered patio with a fan to help keep the space cool. 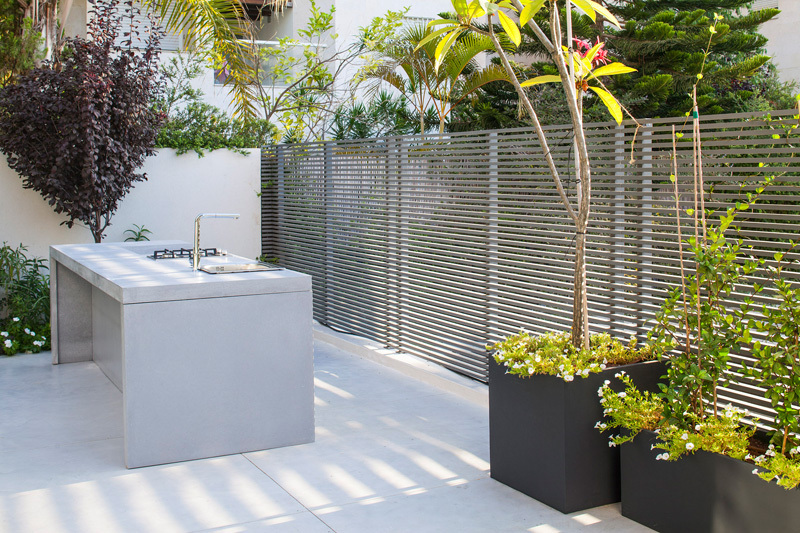 A simple modern fence separates the backyard from the neighbors, with planters that will grow to create some privacy. 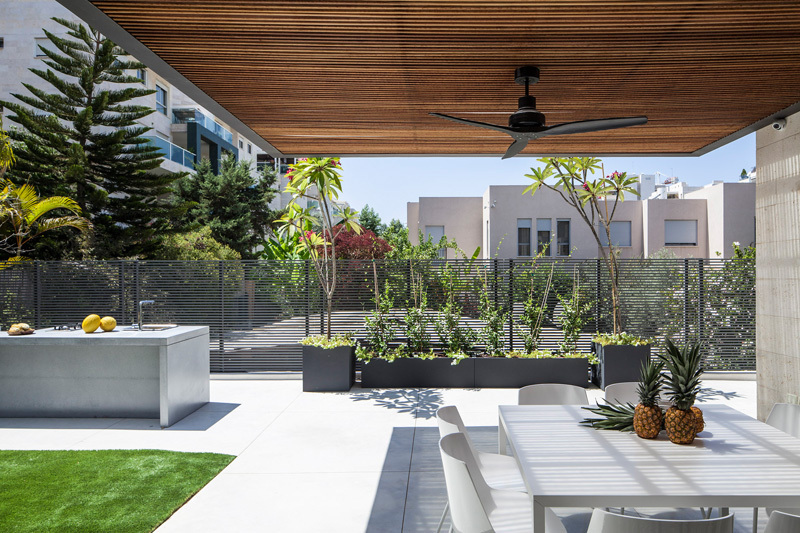 The backyard also features a built-in outdoor kitchen, with a sink and two burners for cooking.